Need more money? Looking for a way to pay down debt? Bank account looking a little bare? But getting a second job outside the home isn’t always practical. If you have little ones at home, working day and night doesn’t make sense. If your day job is demanding enough as is, adding another structured job to the workweek wouldn’t, well, work. So, if you need more money, like yesterday, what do you do? Sure, an online job means you get to work in your PJs, but there’s a lot of other perks too. And if you’re goal is to supplement your current 9 to 5, you’ll especially appreciate these added benefits. Granted, not all online jobs come with extreme flexibility. But if you opt to freelance or set up your own side hustle, you get to set your own schedule and work as much (or little) as you’d like. Even a more traditional contract or employee-based online job can come with great flexibility. These companies often hire workers as moonlighters. This means you can keep a hold of that day job of yours while working flexibly on nights and weekends to make ends meet. If you’ve ever been micromanaged, you’ll definitely enjoy the autonomy that comes with working remotely. When you’re in your home office, the only one lurking over your shoulder is your cat (or kid). Of course this doesn’t mean you can sit idly and still collect a paycheck. But it does mean you don’t have to worry about contending with a manager or boss who always seems to be breathing down your neck. There are few things I like more than making money. But saving time and money come pretty darn close. When you take on a second job from inside the house, you immediately eliminate a long and costly commute. So instead of spending money on gas and wasting time driving to work, you can simply take the 10-second commute to your home office and start earning. Each of these options comes with pros and cons. And what may work for me, might not work for you. So before jumping in, carefully consider the benefits and drawbacks of each. But the reliable pay and stable schedules come at a cost: Flexibility. Often, these online second jobs will require you to commit to a certain schedule well in advance. And it may even mean working mandatory hours — an impossible feat for those with kids or demanding day jobs. Freelancing is a surefire way to fit money making into just about any schedule. And the good news is, anyone can freelance. From writing to marketing and social media management, there are certainly no shortages of in-demand freelance services you can sell to top off your income every single month. But, like anything, freelancing also comes with its own set of cons. For starters, there’s no guarantee you’ll find any work. And, as a freelancer, you’ll have to track down your own leads and pitch to clients to secure gigs — something that can be time consuming! There are so many ways to secure work as a freelancer. You can use popular freelance marketplaces to track down leads. Or you could use email outreach to pitch your services. Heck, you can even start your own freelance website and start marketing yourself on Pinterest, Facebook, Twitter, etc. Really, there is no right or wrong way to freelance — do what makes sense for you! Freelancing and contract gigs have some things in common (like being responsible for your own taxes). But where they greatly differ is how you get work. As a contractor, you’re assigned work. As a freelancer, you source it on your own. For example, let’s say you decide to get a second job online as a transcriptionist. You end up contracting with The World’s Great Transcription Company (TWGTC). As a contractor, TWGTC will assign you work and give you a due date, i.e., you’re assigned work every Monday that is due back Thursday morning. How you get the work done is up to you — as long as you turn it in on time, you’re good to go. Keep in mind, some IC positions may only last for a certain time period — say a few months to a year. That means, once the contract is up, you’ve got to find another side job from home! Work when you want, where you want, as much as you want! Of course, your success will be greatly determined by how much you put into your online side business. And, if you’re pressed for time, you may not be able to put as much into it at first. But you can grow your online second job on your own terms and at the right pace for you — it’s entirely up to you. Seriously, there are a lot of ways to go solo and start your own second job from home — from scratch. I may be slightly biased, but this is hands-down my favorite way to earn. Before jumping in, take a minute to consider which of these jobs is right for you. For some, the stability of an employee job makes sense. For others, extreme flexibility that comes with freelancing may be key. And still some may thrive as an online entrepreneur. Make sure to carefully consider the pros and cons of each and, when ready, start your search. As always, if you have any questions, let me know in the comments below. I’m here to help. 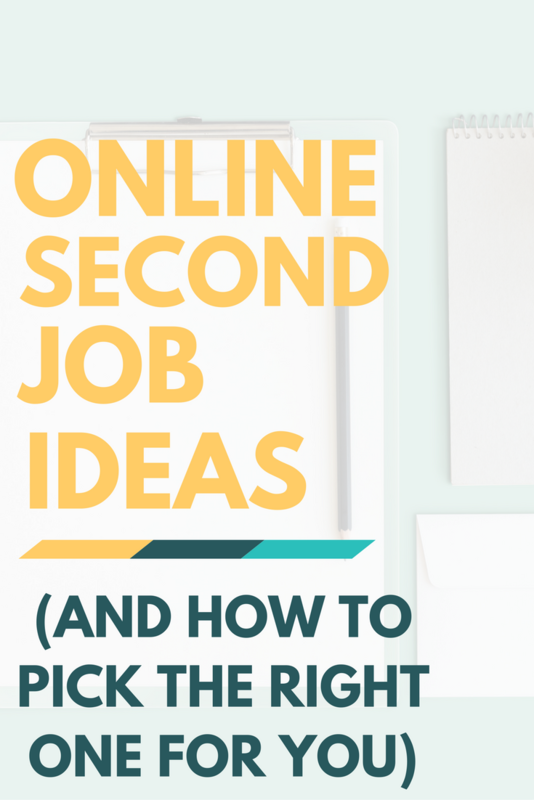 The post Online Second Job Ideas (and How to Pick the Right One for You) appeared first on Work from Home Happiness.